I am Darlene and the owner of My Little House Of Treasures. I live in Ontario, Canada and am married with three sons, 6 grandsons and one granddaughter. I am a hairstylist by trade but am now retired. I love to knit and crochet and do a lot of both. I am a manager with Watkins products and have been with Watkins for 16 years now. Love my home business. 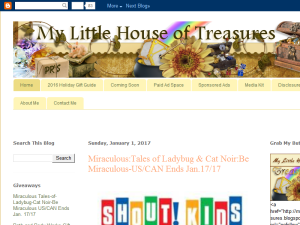 This what your My Little House Of Treasures Blog Ad will look like to visitors! Of course you will want to use keywords and ad targeting to get the most out of your ad campaign! So purchase an ad space today before there all gone! If you are the owner of My Little House Of Treasures, or someone who enjoys this blog why not upgrade it to a Featured Listing or Permanent Listing?